I am not currently at a lighthouse but a place just as beautiful. Pender Harbour is a region midway up the Sunshine Coast. You arrive here by taking a 40 minute ferry ride from Horseshoe Bay in Vancouver. After passing through Gibsons (famed home of The Beachcombers), Roberts Creek, Sechelt, and Half Moon Bay, you finally reach Pender Harbour--it takes about an hour by car. 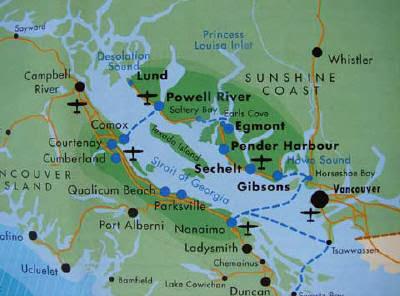 If you continue on up the coast from here, you will come to Egmont and another ferry will take you to Powell River and finally Lund. It is a rugged craggy beautiful place defined by ocean, freshwater lakes, wildlife, mountains, and mists. Oh, and yes, people. Wonderfully eccentric creative people (at least the ones I’ve met so far).